The CSWP (Certified Solidworks Professional) exam is one of the most popular CAD certifications available. This is certainly due in part to the popularity of Solidworks and it’s nearly two decades leading the field. Recently though Onshape has come on the scene and is making a play for cloud based CAD systems. There is not yet an Onshape certification but is can be used to help round out design skills and make you competitive in the market. Dassault Systemes reports there are more than 3.2 million users worldwide these days, though only a fraction of them hold any sort of certification. The certification is designed to show software proficiency, not engineering training, but it can arguably increase your marketability. In the end the ability to apply proper design methods and achieve usable results is key. That makes it possible to use other software, including Onshape, with the same end goal in mind. Those percentages may be off given that some CSWPs are legacy awardees who no longer work in the software regularly. Compare that to Onshape Users. Again note this is USERS not certified holders but it does show the comparative market penetration. As a private company it is hard to get any more accurate numbers. But suffice to say Onshape and their $130+ Million in venture funding are making a dent in those 3.2M Solidworks Users. Taking the exam is relatively straightforward. Most resellers will allow new users to sit for one for free, and every year the annual users conference, Solidworks World, also allows attendees to make an attempt. Studying and preparing for the exam can be done through countless blogs, youtube videos, and training courses. The big surprise though, is that you do not need Solidworks to prepare for the exam! 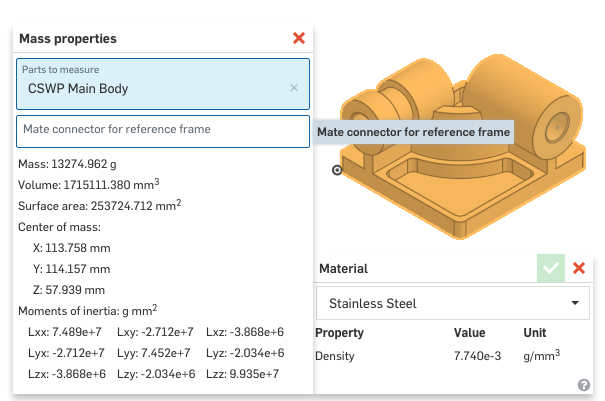 Accessibility of Solidworks is still an issue for many users. Though student copies and term licensees help, the cost of a full seat is still around $5000. Hardware requirements also make it tough for anyone who does not have a powerful workstation at home. Onshape on the other hand is FREE for a single user and can be run from a browser. There is no install required so even a novice can get logged in and start poking around within minutes. Since the CSWP practice exams are released online I decided to see what was possible using Onshape to model the parts and get the answers. The biggest issue for me in modeling the CSWP items in Onshape was the inability to get the right material. 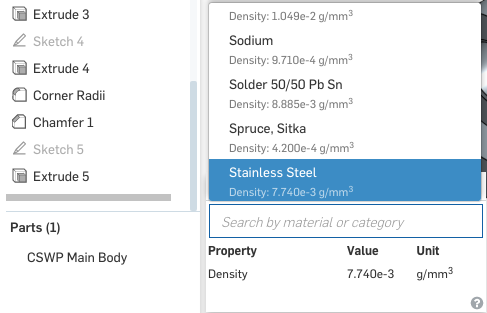 Onshape is limited in the materials available for assigning, and does not yet allow a user to define a custom density. Even with this limitation it is possible to get the correct value through simple arithmetic. Knowing the equation (Mass= Density * Volume) is all that is required. Using the “mass properties” even without the correct material will still reveal the part volume. For my part I assigned a similar material that only varied by one significant figure (0.00774 in Onshape versus the defined 0.0077 required by the software). This allowed for a quick reference to make sure I was on the right track and for some of the multiple choice questions got close enough to be able to assign the correct value even without doing the calculation correction. My modeling skills are a bit rusty and the controls for Onshape vary slightly from Solidworks. In a few instances I used work arounds that are NOT ideal, but as is the case with the CSWP the design intent is not actually tested. For anyone who wants to take a look the version tracking and branches of Onshape made it easy to save individual questions as well. 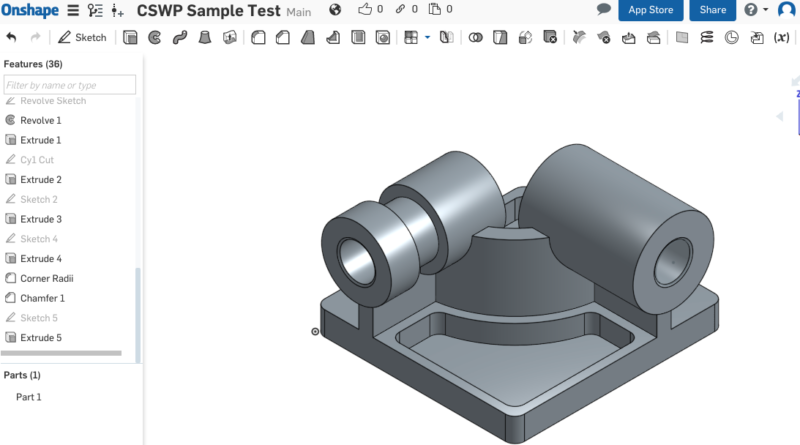 A CSWP Sample Exam part modeled in Onshape (public file). The final benefit of Onshape is the ease in sharing files. I have made the file public on the forums so anyone who wants to see how these parts were created can do so. Again I’ll caveat that there are a lot of things wrong in the model, despite getting the “right” answer. If you see any of these feel free to point them out and highlight them in the comments or through branching the file.